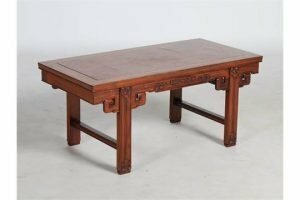 A Chinese Huanghuali serving table, late Qing Dynasty, the panelled rectangular top with a pair of pierced carrying handles at the short ends, above a frieze decorated in relief with scroll motifs, raised on rectangular section supports with inverted scroll feet detail, united by a panelled undertier. 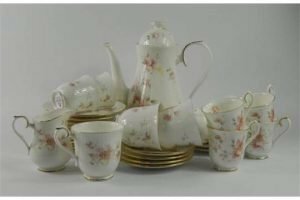 A Royal Albert For All Seasons pattern part coffee service, decorated on a white ground, with pink flowers, comprising six coffee cups, five tea cups, saucers, six side plates, teapot, and a milk jug. 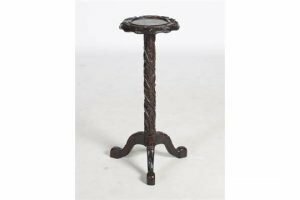 A Chinese dark wood plant stand, late 19th/ early 20th century, the circular top with bamboo carved border, on a cylindrical column with spiral carved bamboo, raised on three downswept supports. 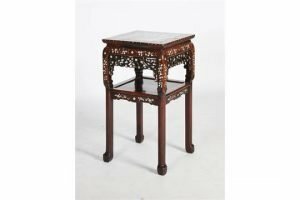 A Chinese dark wood and mother-of-pearl inlaid jardiniere stand, Qing Dynasty, the square top with a white and black veined marble insert, above a pierced blossom and bird carved frieze, raised on four square section supports united by a square under tier. 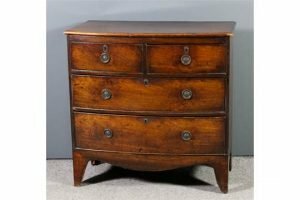 A George III mahogany bow-front chest with moulded edge to top, fitted two short and two long drawers, shaped apron and bracket feet. 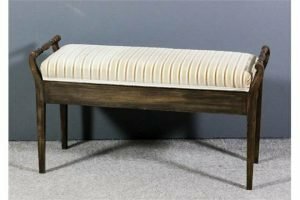 An Edwardian mahogany duet stool inlaid with rosewood bandings, the lifting seat upholstered in cream striped cloth, on square tapered legs. 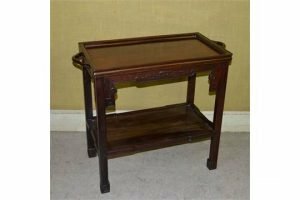 A Chinese dark wood and burr elm low table, 20th century, the rectangular top with burr elm panel insert above a scroll carved frieze, raised on four rectangular supports united by cross stretchers. 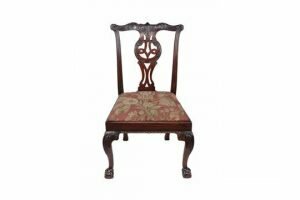 A George III mahogany side chair, circa 1770, the curved carved top rail above pierced carved vertical splat, drop in seat and cabriole legs with leaf carved knees and terminating in ball and claw feet. 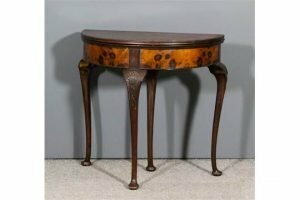 A 1920s figured walnut semi-circular card table of “Queen Anne” design, the baize lined folding top with deep frieze, on cabriole legs with shell carving to the knees and pad feet. 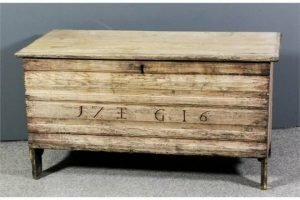 An early 18th Century stripped pine plank coffer, the two plank top with moulded edge and with moulded front initialled EG and dated 1716. 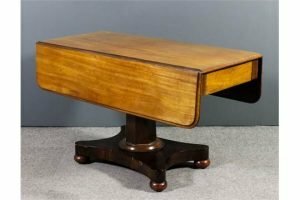 A Victorian mahogany Pembroke supper table with moulded edge to top, fitted one frieze drawer, on octagonal turned central column, the rectangular inswept base with bun feet and castors. A Kashquli rug, approximately 146 x 100cm. 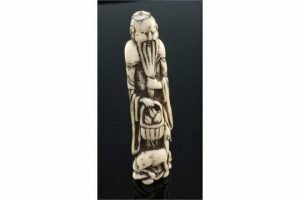 A Japanese stag antler netsuke of a standing sennin, Edo period, holding a basket of peaches with a deer at his feet. 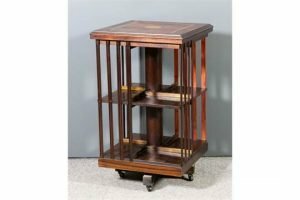 A mahogany square two tier revolving case in the Edwardian manner, the top with moulded edge and inlaid with satinwood bandings and central circular fan motif, on X-pattern supports and castors. 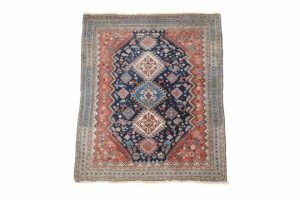 A Senneh rug, the dark blue field woven with an intricate lattice of stylised flowers within a red field border of stylised flowers, approximately 130 x 190cm. 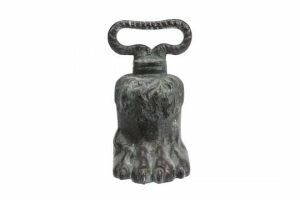 A Regency bronze door porter, circa 1815, cast in the form of a ‘hairy paw,’ with rope twist loop handle above. 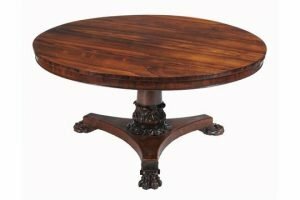 A George IV rosewood centre table, circa 1825, the circular top with apron above substantial turned pillar and acanthus vase, trefoil base terminating in lion paw feet. 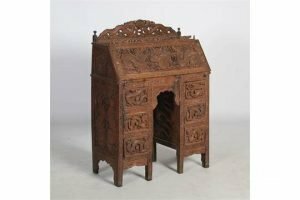 A Chinese carved wood bureau, Qing Dynasty, the hinged fall front opening to a fitted interior of pigeon holes and drawers, above three drawer pedestals, profusely carved all over with dragons and shou characters. 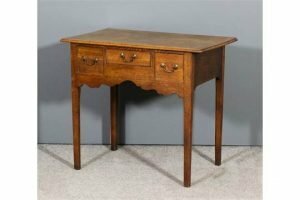 A George III oak lowboy with moulded edge to top, fitted three small drawers above shaped apron, on square tapered legs. 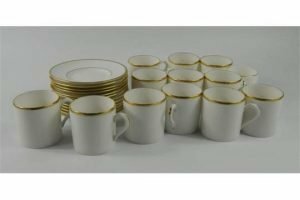 Royal Worcester Capri pattern coffee cans and saucers, on a white ground, decorated with a gold rim, comprising twelve cups, and twelve saucers, and a later smaller can.